ISLAMABAD: The Japan government on Wednesday pledged a contribution of 2.7 million dollars to support refugees and host communities across Pakistan. 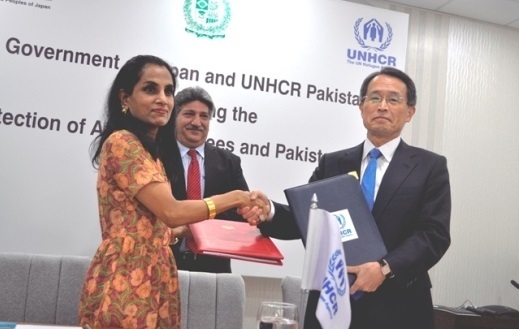 Japan’s Ambassador to Pakistan Takashi Kurai and UNHCR Country Representative Ruvendrini Menikdiwela signed the agreement with Chief Commissioner for Afghan Refugees Saleem Khan in attendance at a ceremony here. The Japanese envoy hoped that the grant aid would be fully utilised for the future of the Afghan refugees and the host communities, especially young generations and mitigate the burden of the host communities. He said that Japan highly appreciated the efforts made by the Pakistani people as host who had been accommodating the refugees for nearly four decades. Menikdiwela commended the people and the government of Japan for the contribution, saying it would allow UNHCR to continue supporting vulnerable Afghan refugees and youth of the host communities. “Such support will have a positive impact on the lives of the Afghan refugees allowing them to have access to better healthcare services, livelihood opportunities, as well as legal support,” she said. The contribution will support UNHCR’s interventions in the areas of health, livelihoods, as well as the provision of legal support to around 1.39 million registered refugees. The new funding will benefit some 475,000 refugees and youth in the host communities in Punjab, Khyber Pakhtunkhwa and Balochistan. Part of Japan’s contribution will be invested in the health sector to improve access to healthcare services in Pakistan. This will support around 430,000 Afghan refugees with health issues. The UNHCR’s aid and legal advice programme is implemented through partners in nine centres in the main refugee-hosting areas across Pakistan. The new funding will support 45,000 refugees and help continue the provision of free legal advice and legal aid, as well as the court representation for the refugees who have been detained. In addition, Japan’s aid will be spent on bolstering refugee’s self-reliance. UNHCR will provide livelihoods support to the Pakistani youth and the Afghan youth through vocational and technical skills training. Last year, the Japan government also provided some $3.8 million specifically to the UNHCR Pakistan while Japan has been assisting the refugees in Pakistan and their host communities for over 10 years with grants of some 200 million dollars. Pakistan continues to host 1.39 million refugees. Around 4.3 million Afghans have returned to Afghanistan since 2002.